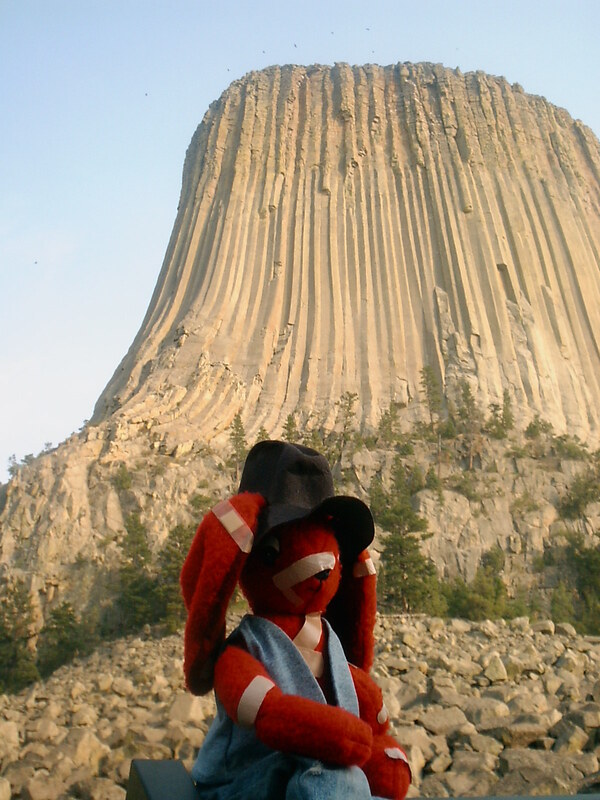 Here is Stu Patterfoot visiting Devils Tower National Monument in the Black Hills of Wyoming. You can see this unique rock formation rising dramatically from the prairie for miles as you approach it, growing larger and larger and larger. Climbers have tackled this formation for a couple hundred years. Although during the month of June, most climbers honor the Native Indians and do not climb these 30 days for related Indian ceremonies and prayers. Stu didn’t get much past the crumbled base. Using US National Parks for writer inspirations for settings has existed before there were even National Parks. Devils Tower was used as a backdrop for “Close Encounters of the Third Kind,” but visiting it after seeing the movie was a bit disappointing in that respect. Spoiler alert: FYI, you oldsters or old movie buffs, there are no aliens from other planets on the grounds. But I can’t guarantee the same if you look up. This entry was tagged Devils Tower National Monument, rock climbing, Settings. Bookmark the permalink.